Advanced Google Maps is a WordPress Map Plugin that renders Smooth Open street Maps over WordPress Page/Post using easy shortcode. Additionally, there are other awesome features like Map Styles, Direction Map, Custom marker Location etc. The maps that you add to the page can be customized with ease. 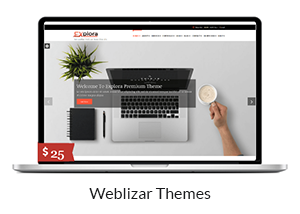 Some of the customizations that you can carry out using this responsive plugin. There is an awesome collection of user-friendly Shortcodes to add unlimited locations by address or latitude and longitude, etc. Step 1. 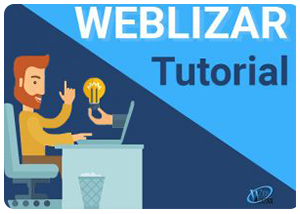 First download the plugin from your Weblizar Account. Step 2. Upload, Install & Activate plugin into a WordPress site. Step 1. First download the plugin. Single Location Map – Add Location, You can easily show your location by its address or latitude and longitude. 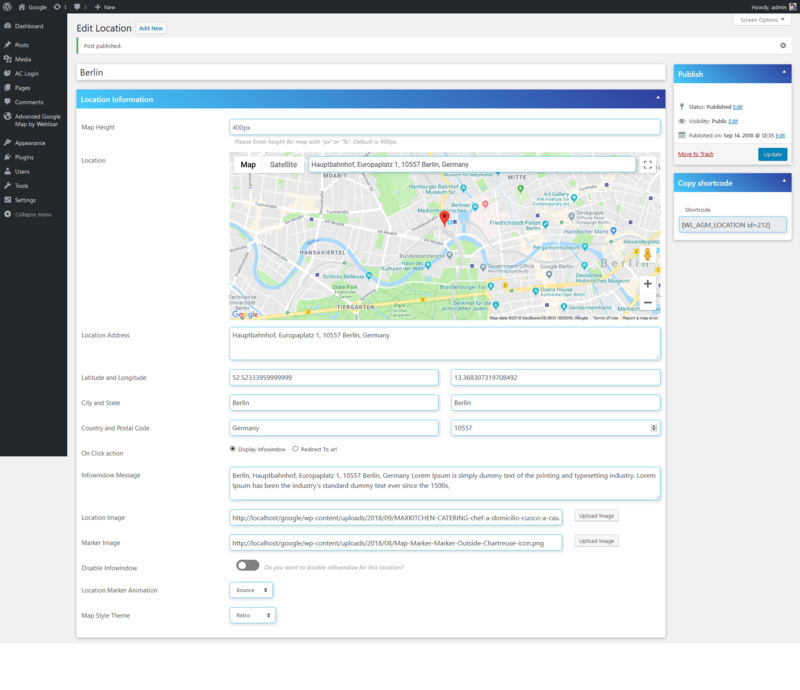 Also you can customize it, from its backend as your needs..
Multi Location Map – Add multiple Locations in a single map. You can display a number of locations in a single map at the same time. 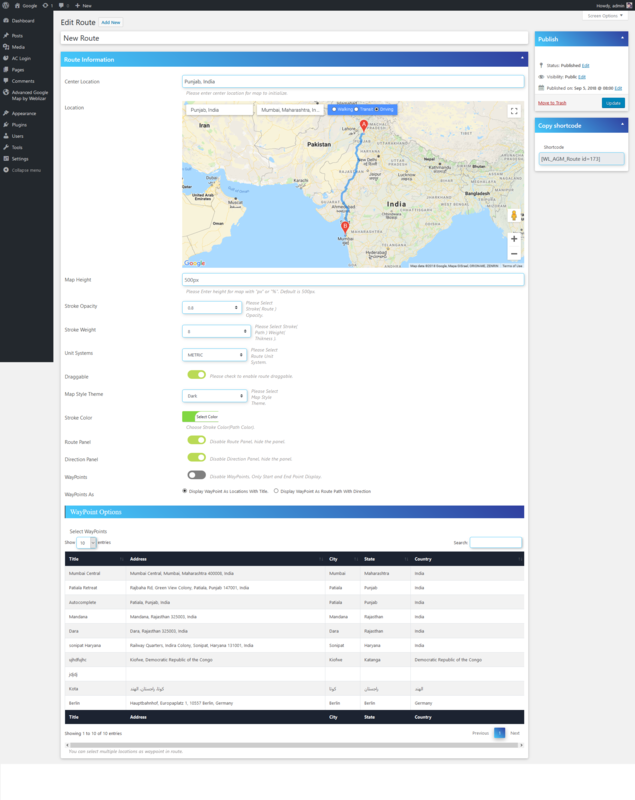 You can show your all branches locations in a single map or you can customize it (Information to display in Infowindow with your custom style). Interactive Map – Add Interactive Map View. This allows you to embed a colorful Interactive map into your WordPress powered site by a few clicks!. Whenever you need to give your visitors a simple yet effective way to navigate through regional sections of your site, or if you want to provide some geography-related information to your visitors. Route Direction Map – Add Route or direction map. Help your users find the best way to get from A to Z with comprehensive data and real-time traffic. You can display routes from one location to another on a map. Get directions for transit, driving, and walking. Calculate current or future travel times based on real-time traffic. Custom Markers – You can change the icon of a Google maps default marker as you desire. Simply add/upload your marker image it will show as location marked on map. Map Customization – User friendly option to customize your map. You can easily change its height, width, background color, region color, tool-tip font color etc..
Multi Language Maps – You can show or change map language. Means you can show your map in your desired language on the posts or pages. Map Theme – You can change the Map theme style while creating it from the options. Using a styled map, you can customize the presentation of the Google base maps, changing the visual display of such elements as roads, parks, and built-up areas. 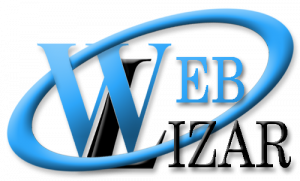 Google Map Widget – By using this widget you can easily show your custom map in the sidebar or you can show it in footer widget section. 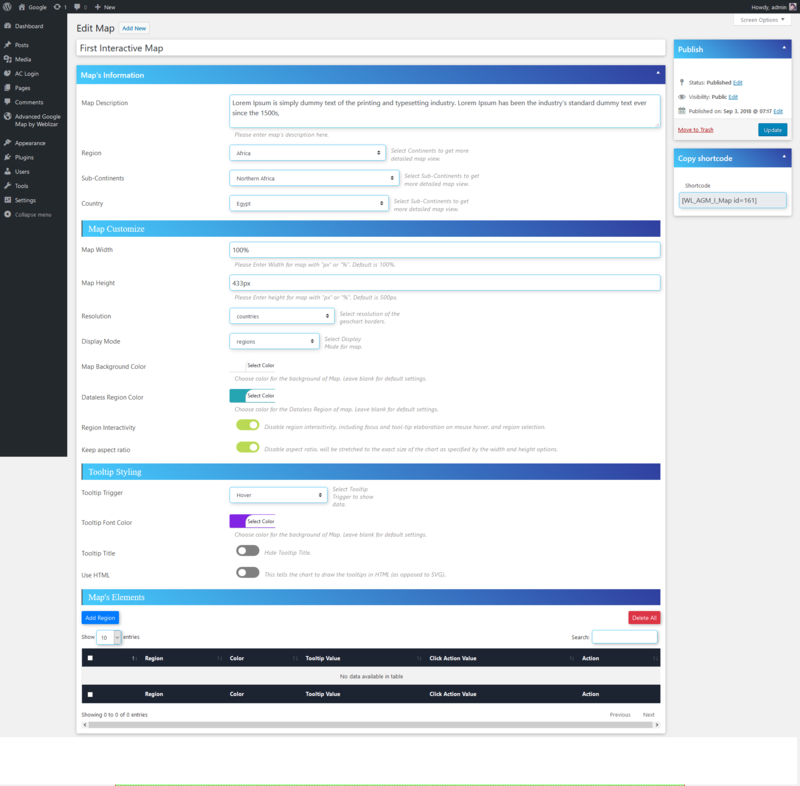 Centralized Dashboard – Centralized dashboard to manage all shortcodes. You can add, delete, edit any shortcode from here. Info Window Card – An info window displays text or images in a popup window above the map. Info windows are always anchored to a marker. You are also able to customize the contents and design of info windows.. Translation Ready – It is a good idea to prepare Plugins so that it can be easily translated into other languages. Translation into other languages, which is a large part of localization.. Here, you have to enter Google Map API first to use this plugin’s features. if you have a key then insert it. If you don’t have any key, then you can create a key from here Google Map API. Here, you can also select map language to display map in that language. From Here, you can manage all map’s shortcode. add, delete, edit etc. You can manage all of this from this “Centralized Dashboard”. Here, you can add Location which you want to display on map. Also add your own custom marker on location with InfoWindow( With location details ). Here, you have to enter location in search field which displays on map preview, after you entered location it shows suggestions then select one, it find “Latitude” and “Longitude” automatically. Here, you can show location info with the “InfoWindow box” just put details which you want to display. or you can use “Redirect to URL” to redirect user when it clicks on location. You can also change its theme and marker animation. You can also add Location on the basis of Categories. Here, you can add Multiple Locations which you want to display on map. Also add your own custom marker for each locations om map with InfoWindow( With location details ). To initiate this map you have to enter “Center Location” first, its mandatory field. Center location its a location which shows first on map load, you can also customize it( InfoWindow, Location, Click Action, Marker ). Here, you have map controls which you can manage as you needs like ( “Map Zoom Level”, “Map Type”, “45° Imagery”, “Draggable or Scroll”, “Street View”). To show multiple locations go to “Choose Locations”, here you have list of locations which you create in “Single Location Maps” to add these location just click on each locations which you want to display then update/publish it. It will display on map as multi locations. 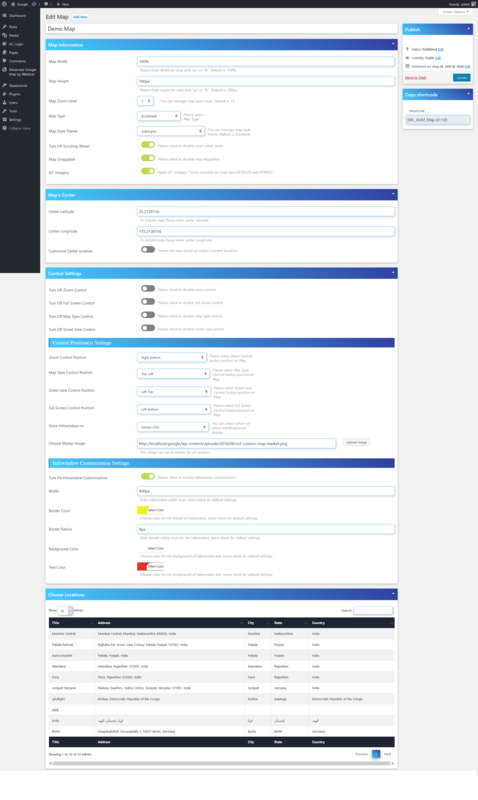 Here, you can change or customize “InfoWindow” for locations ( Color Style, Border , Text Color , Width ). First give each location its category while you making single locations. Select “Display Locations As” to “ Display categories” to show location as categories. Then select categories ( Those category locations you want to display on map ). Here, you can add “Route” or “Direction” from one location to another with comprehensive data and real-time traffic. To initiate this map you have to enter “Center Location” first. Its mandatory field. ( You can put start location here ). Also you can display “Way Points” in between route as locations with “Route directions”, or “location address”, You can show multiple way-points in a single route. You can also manage route mode like transit, driving, and walking, Also route direction “Unit”, Route Stroke weight and opacity, Map Theme. Here, you can display Interactive world maps, regions with some statistical information. Just select “Region” which you want to display. You can customize it from “Map Customize” options. In “Map’s Elements” option you can add regions which to want to display. For more detail see this google map page “Continent Hierarchy and Codes“. Just add regions and publish it. 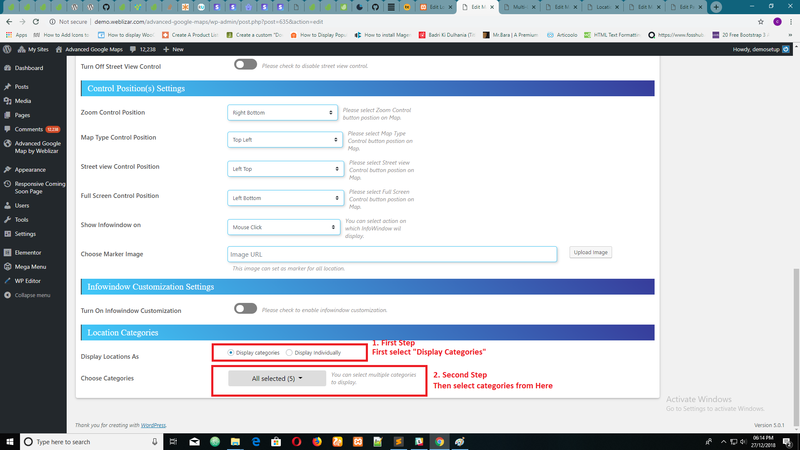 To show these all map’s on any page or post just copy the shortcode which shows top right side while you creating maps. 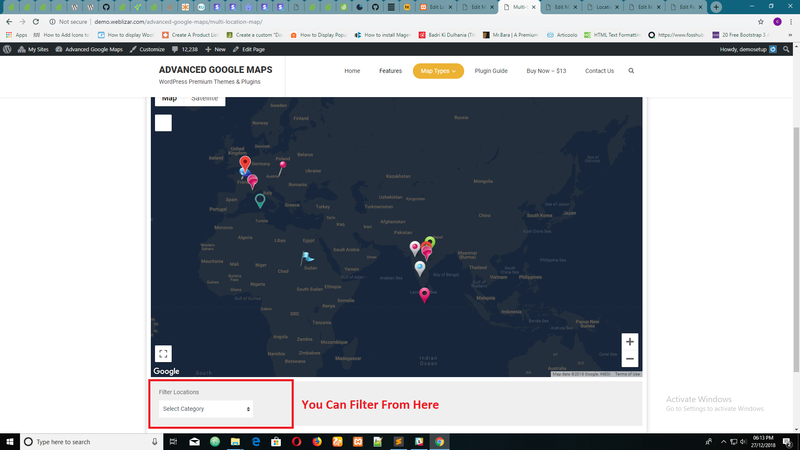 You can use “Advance Google Map By Weblizar” in widgets to display all google maps in sidebar or footer widget section, It shows all map’s title just select one from it and its done.